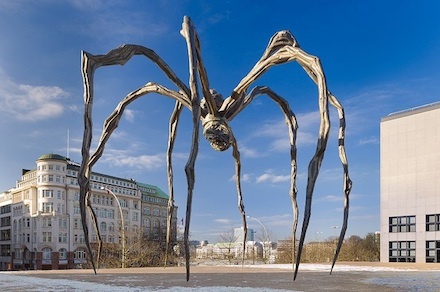 Passage Dangereux, on view now at the Hamburg Kunsthalle, is a centennial celebration of the late Louise Bourgeois, showcasing work from the last 15 years of her life. Regarded as one of the most influential artists of the twentieth century, Bourgeois’ work evades stylistic categorization, toeing the line between figuration and abstraction in a range of artistic genres, media, and modes of display. 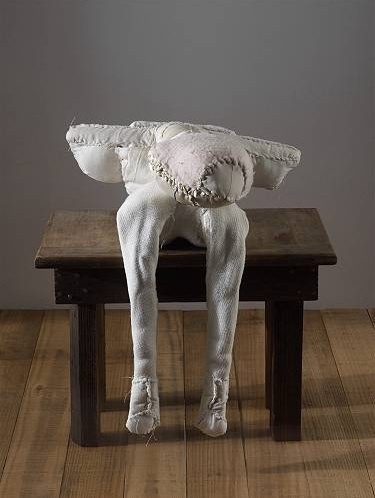 The Kunsthalle honors this unique artist on the advent of what would be her 100th birthday, in a diverse show of sculpture, installation, and print, several of which have never before been seen in Germany, to confront existential and deeply autobiographical themes. 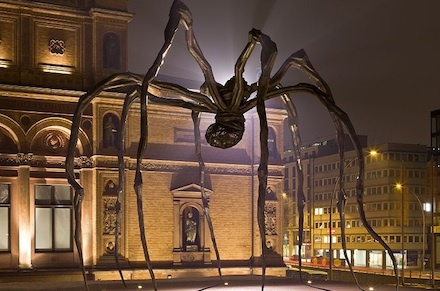 Visitors are at once greeted by the monumental sculpture, Maman—a 30 foot tall spider constructed in steel, bronze, and marble, installed on the platform outside the museum—an iconic and recurring figure in Bourgeois’ late work. A proclaimed tribute to her own mother, the spider symbolizes maternal benevolence and protection, invoking themes of renewal and creation as well as fear and death, setting the ominous tone that resonates throughout the exhibition. In addition to the now hallmark spiders, Bourgeois is largely remembered for her anthropomorphic works in latex and marble, though her oeuvre encompassed a wide range of disparate stylistic periods in itself. 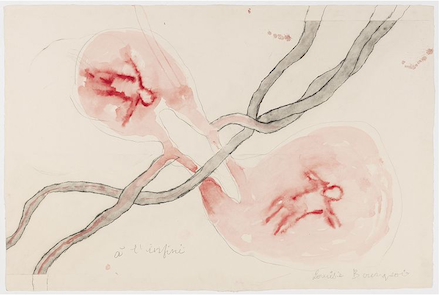 Born in Paris in 1911, Louise Bourgeois’ early artistic career developed alongside French Modernism, studying under Fernand Leger and moving amongst Surrealist circles. Upon emigrating to New York City with her American husband Robert Goldwater in 1938, she maintained relationships with other French expats such as Marcel Duchamp, and befriended a host of Abstract Expressionists, yet always maintained her unique artistic mode. In fact, some appraise Bourgeois’ work as a subversion of modernist formalities, testament to her originality within the critical discourses of the twentieth century. A large part of this exhibition, and the work from which the exhibition’s title comes, is dedicated to a series of installation sculptures, called Cells, which Bourgeois first began constructing in the 1980s. 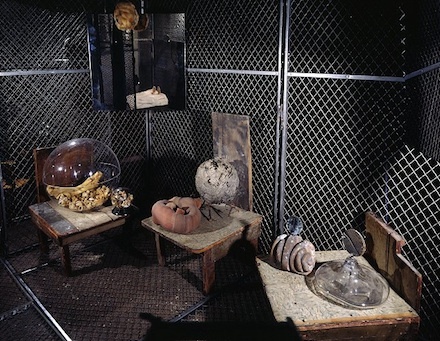 These enclosed, cage-like spaces circumscribe found and sculpted objects within a constricting psychic container, full of personal artifacts, yet evocative of human absence. 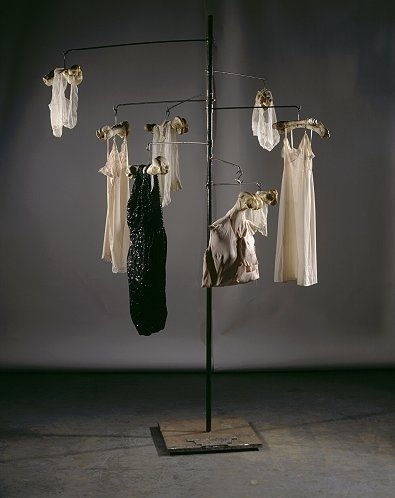 The show’s eponymous work, Passage Dangereux (1997), is the largest of these Cells—a morbid jewel box, reliquary of memories of people and places, traumas and dreams—the physical manifestation of a psychological state. This staging of space is activated by the voyeuristic intrusion of the viewer’s gaze. Her early works of wooden totemic figures installed directly into the gallery ground initiated her sculptural focus, moving away from painting. Later she shifted to more malleable media, utilizing latex and rubber to mold organic—and often sexually charged—forms that recalled ambiguous gender. These biomorphic pieces exude human corporeality, all the while radiating psychological thrust. Through a range of media from rubber to marble, Bourgeois harnesses the vulnerability of bodily forms to explore gender, sexuality, family relationships, and existential questions about life and death. Many of the works in this exhibition are distilled in the same emotional matrix as earlier pieces, but represent yet a further re-articulation of her material process, which, in her later years, utilized textiles, fabrics, and old clothing. Departing from the visceral eroticism of earlier sculptures, works in this medium remain psychologically anchored in concepts of time, memory, and childhood. 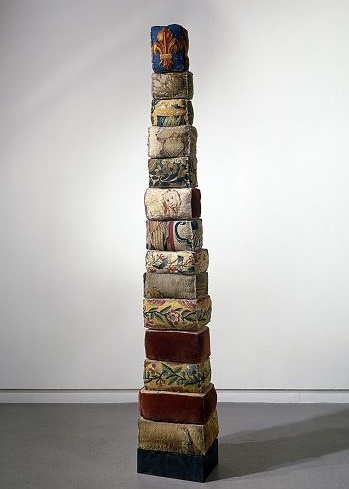 Her preoccupation with cloth and weaving is showcased in this exhibit as totemic cushion towers, fabric covered busts and steel, tree-like garment racks sprouting with bone hangers, as well as two-dimensional pieces constructed with fabric and thread, which form linear and abstract patterns. These works are undoubtedly rooted in her personal family history—her parents owned a tapestry restoration shop and often employed the young Louise to draw in lost fragments. Her mother, the diligent weaver who inspired the spider icon, is metaphorically revived in her thread work and sewn pieces. Like earlier installations that allude unabashedly to the philandering betrayal of her father, the use of the sewing medium represents an attempt to mend the traumas of her childhood through artistic catharsis—to repair psychological tears in a patchwork of painful memories and tactile emotions. 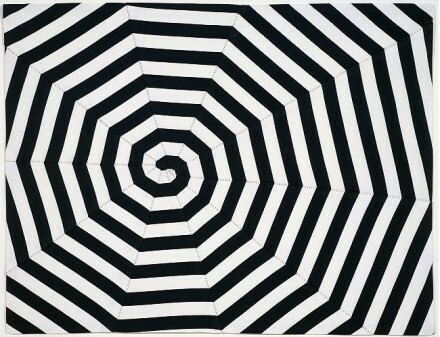 The abstract, geometric patterns she created out of fabrics in pieces such as Untitled (2005), spiraling like a spider’s web, contrasts with the organic fluidity and return to a biomorphic vocabulary in other works such as A L’Infini, a series of 14 large-format etchings, comprised of intertwining lines and forms that recall biological imagery as much as human figures. Bourgeois’ unique visual vocabulary and distinction from stylistic movements throughout the twentieth century, as well as her powerful expression of emotion through form, is demonstrated in this exhibition of her latest works, establishing and anticipating her lasting influence upon contemporary artists. This show is curated by Brigitte Kölle with Curatorial Assistant Luisa Pauline Fink. 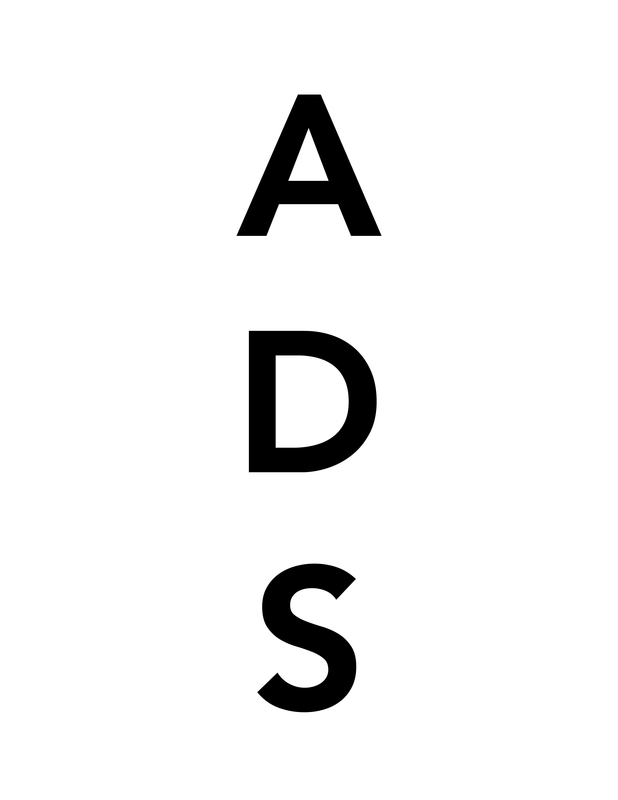 This entry was posted on Sunday, April 8th, 2012 at 12:30 am	and is filed under Go See. You can follow any responses to this entry through the RSS 2.0 feed. You can leave a response, or trackback from your own site.